NEWS: Van Sciver, Simone, Cinar, Collections, and More! 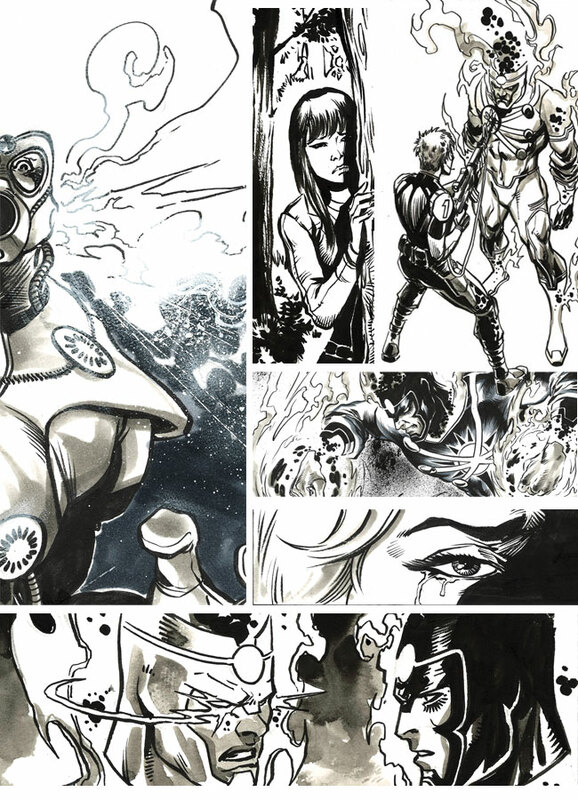 Yildiray Cinar, current Firestorm artist, posted a rockin’ new teaser image promoting issue #3! This image is similar to the teaser images released prior to issue #1 and #2. Could this be the new villain called Helix? I love the circles in place of the pupil; looks a little reminiscent of the circles in the series logo! Click the image below to enlarge. Ethan Van Sciver, current Firestorm co-plotter and cover artist, posted a message on his Facebook last week about The Fury of Firestorm: The Nuclear Men #7. 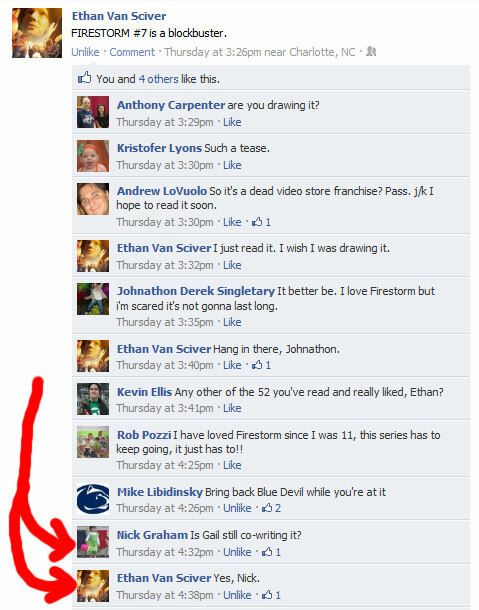 In the comments Ethan confirmed that Gail Simone, current co-plotter and scripter, will continue to write Firestorm. Some fans suspected that Gail would leave the book after issue #6. Now we know she’s hanging around a while longer! Hooray! See the screen shot below. Ethan Van Sciver has been spending some time lately over on the DC Comics Message Board in the Firestorm forum. He created a thread allowing fans to directly ask him questions about the new Firestorm series. The thread is entitled, “FIRESTORM QUESTIONS FOR ETHAN VAN SCIVER! Ask here!” Even if you don’t have a question for Ethan, stop by the message board and check out what questions he’s answering. My thanks to match-head Keith Baker for the heads-up about this! * First, DC announced their plans to collect The Fury of Firestorm: The Nuclear Men #1-6 into a soft cover scheduled for release in September 2012! Click here for details. My thanks to match-head Ken Deemer for the heads-up about this collection! * Second was a post on The Source entitled, “3 Things you Didn’t Know About The Nuclear Men”. Click here to read the post and check out the accompanying artwork below by Yildiray Cinar (click the image to enlarge)! Thanks to match-heads Eric Sellers and Ken Deemer (again) for the heads-up about this posting! Finally, The Fury of Firestorm: The Nuclear Men #3 hits the stands in one week! Be sure to reserve your copy now! Posted in: Advertisements, Comic books, Ethan Van Sciver, Firestorm #09: New 52 v1 (Firestorm Protocols), Firestorm comic vol. IV, Gail Simone, News, Yildiray Cinar. ← Episode 7 of FIRESTORM FAN and AQUAMAN SHRINE Podcast! Gah! Make up your minds! @liquidcross – Thanks for that additional news. I wrote this piece over the weekend prior to that news breaking. Much appreciated! Thanks to Keith Baker as well – he gave me a heads-up over on Twitter. I am looking forward to seeing the New 52 collected editions. I am curious as to what the trade dress for each of them will look like. Will there be a unifying theme for all 52? Or will each one be different? Maybe just a “New 52″ branding on each volume perhaps?